St Paul’s is a family friendly church with a focus on growing strong people and families of faith. We are a member of the Evangelical Lutheran Church of Canada (ELCIC). St. Paul’s was formed in 1896 and has been serving the Ellerslie area ever since. Many things have changed over the past 121 years, but not our commitment to the gospel of Jesus Christ. Come and visit us - we welcome all. Mission Statement Embraced by the grace of God, St. Paul's exists to engage the community, equip for discipleship and enrich the lives of those we encounter. Purpose The purpose of St. Paul's is to equip for discipleship, empower for ministry, welcome and embrace our communities. Vision Statement Embraced by the grace of God, St. Paul's vision is to be the leader in family ministry by walking daily as disciples of Christ. Our Sunday School classes start at 11am following our 10am service. We welcome all children from preschool to grade 6 (even if you are just visiting us for the day). 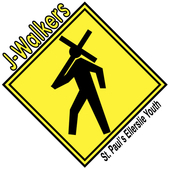 J-Walkers is the name of our youth group. The youth chose this because “we all walk with Jesus”. We have an active youth program and we welcome any youth grade 7-12. If you're looking for a place to belong, this is the place. Please contact Tammy Kirkwood for more information about our youth.